If you live in Plumstead SE18 and your garden needs a touch. You have found the right gardening company in your area. 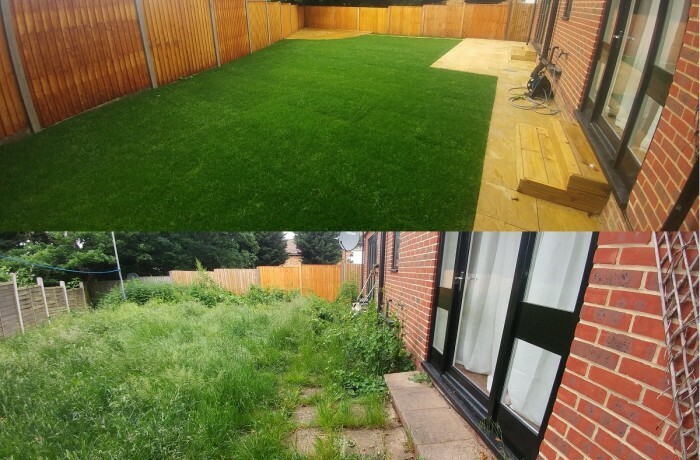 The Landscaping services that we provide in Plumstead and Woolwich SE18 are up to the highest standard of gardening and landscaping. Have you just both a property? Just like the one on the photo on the left. If the garden has been neglected for months or even years. You will need our professionalism! Often properties for sale stay on the market for long period of time, not only the weeds are the problem. Many animals like rats and foxes make their homes in overgrown gardens. Quality turf in SE18 At Green At Home Ltd we only use the best turf on the market. Following few important rules on how to lay turf, we always achieve the best results.